In May 2006, two months after Warner Bros. released its film adaptation of V for Vendetta, someone posted to the irreverent website 4chan a series of cartoons showing a stick figure called Epic Fail Guy picking a Guy Fawkes mask out of a trash can. Why he does that is not clear. What this was supposed to mean is not clear. But Epic Fail Guy, with and without the mask, remained a popular icon on the site. In January 2008, a group of computer hackers who often posted on 4chan got upset that the Church of Scientology was trying to remove embarrassing videos from the web. Announcing themselves as a loose organization called Anonymous, they launched “Project Chanology,” an attack on that church. The next month, some participants in that protest appeared on Canadian television and on picket lines wearing Guy Fawkes masks, as the photo above shows and the Boston Globe reported. 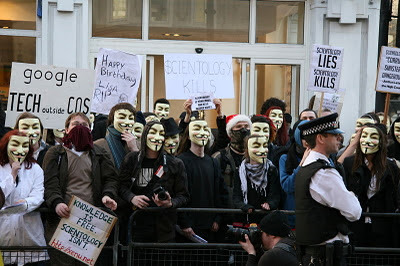 According to some sources, those masks were supposed to signal that Scientology is an “epic fail,” or was headed for a “Year of Epic Fail.” Few people outside of 4chan were acquainted with Epic Fail Guy, however. Therefore, most observers probably read those masks as symbols of a more general anti-authoritarian sentiment. Either way, there’s a fair amount of irony in the representation of a religious zealot being used to protest a religion. From those protests, the Guy Fawkes mask was picked up by participants in Occupy Wall Street and similar protests around the world. But not just any such mask—the design from the V for Vendetta movie has now become the standard Guy Fawkes mask, eclipsing other images of the historical figure. Both creators of the original V for Vendetta comic, Alan Moore and David Lloyd, have applauded the use of their anarchist icon in such political protests. And that brings yet more irony: the more readily available V for Vendetta mask is a licensed product of Time Warner (though I have no doubt there are also knock-offs on the market). Thus, the product of a big business is being used to protest the corruptions of big business. Obviously, the symbolism of Guy Fawkes has evolved over the years, just as Americans have shifted around and reinterpreted the traditions of the Fifth of November since the 1700s. Yet all the different versions share some element of upending the current order—possibly just for a night of misrule, possibly in fundamental ways. That was part of colonial New England’s Pope Night processions, part of Lloyd’s smirking character design, and part of the recent political protests against entrenched power. I love the irony that you point out that the Occupy Wall Street folks wearing a "V For Vendetta"-styled Guy Fawkes mask are in reality utilizing a trade-marked image from Warner Brothers, a subsidairy of Time Warner Corporation. One of their enemies. But wouldn't a Fortune 100 corporation be part of "Big Finance" almost by definition? By “Big Finance” I mean the financial-services industry. Time Warner certainly has a lot of finances, but the company produces actual magazines, movies, television shows, books, &c. Some folks might not like “Big Media” and its political influence, but at least we can see the products of its work. The financial-services industry makes its money by moving money around, and that’s harder for outsiders to see and understand. Indeed, in some activities that led to the Bush-Cheney recession, it looks like no one really understood certain financial “products.” There are now many court cases charging that some were fraudulent. I think “Big Finance” by and large makes our economy more efficient, but it’s failed the larger society lately. It seems notable that Occupy Wall Street criticizes the “1%” in financial services but doesn’t express the same vitriol about people who earn very large salaries in entertainment. We can see what entertainers do, whether we like it or not. It’s harder to see the work of someone who helps to design a risky collateralized debt obligation and then short-sells it. Thanks for the Guy Fawkes research. I liked your little series. I don't find anything weird about people protesting using the oppressor's own products. Is there anything about it that's unusual? The old Marxist saw about the capitalist selling you the rope you use to hang him - that'd be only one of many ready examples.